Not everyone world love going to the dentist. Some of us dread sitting in that chair and having their teeth cleaned or pulled. The dental office doesn’t have to be a dreadful place for you and your family. In fact many offices now specialize in techniques that allow patients to fully relax and feel comfortable all throughout visit. Patients have the option to watch TV, listen to music or enjoy the relaxing smell of incense during their visit. Starting good habits when you are young is the key to having relaxed dental visits. Having a good relationship with your dentist will make it easier for you to keep those regular checkups. If you grow up knowing it is a necessary step in your dental health you will be more apt to continue on the road to a healthy dental lifestyle. Whatever the excuse it is time to make that appointment. Dentists can tell so much about your health from the present condition of your mouth. It is as important as a yearly physical since having healthy teeth leads to a stronger confidence in you. Try to follow the tips below and soon you will find going to the dentist will become less of a chore. Instead the dental visits will become something you look forward to. The first tip is fairly easy to do. You will need to find a mouthwash that has the ability to stain the areas on your teeth that have plaque buildup. This is a great tool to begin with since you will know where exactly your problem areas are. After brushing your teeth and flossing you can rinse with the mouthwash and it will show the areas that still need improvement. It is important to keep up a routine of brushing and flossing at least once a day. Twice a day is even more favorable and recommended by most family dentists. Another tip is to have a timer set for two minutes while you are brushing your teeth – the suggested amount of time for brushing. At first this may seem like a long time but it is best to have a way to measure the time so that you don’t skip out on valuable minutes each day. Look at it this way, two minutes of brushing can save you hours in the dentist’s office later. Dentists also recommend avoiding brushing your teeth too hard since this will only lead to gum bleeding. Over brushing can cause serious gum issues like periodontal disease. Remember that consistency is the key to stopping plaque buildup and not hard brushing. Moderately brushing twice a day is sufficient. If you brush too aggressively your gums will eventually recede and become sensitive to brush. Drinking bottled water with fluoride in it and avoiding foods that have too much sugar also help fight against dental problems. Products that contain fluoride will strengthen your teeth and build healthy gums. Also, make it a point to see the dentist every six months and replace your tooth brush every three months to avoid germs for further preventions of dental problems. Lastly, if you find going to the dentist is stressful for you, then bring a friend along for support. Having someone to talk with while waiting for your turn can keep you calm and ease the anxiety. 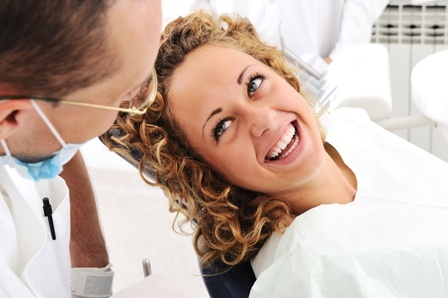 A dentist visit should be an experience that you leave feeling good about. Your family dentist will surely do everything they can to make the experience one that is more enjoyable.